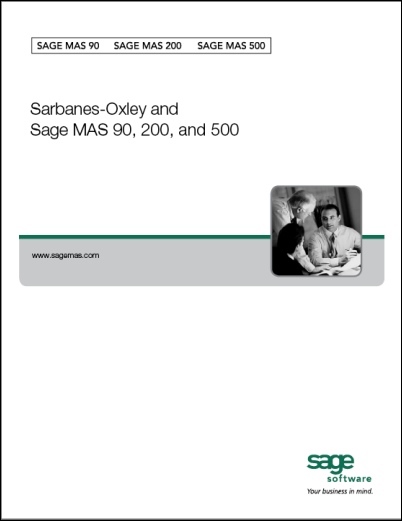 Sage just updated their library online with a free white paper that explains how their Sage MAS 90 , MAS 200 and MAS 500 products are compliant with SOX regulations. The document is quite good and clearly spells out several myths about the act including that using one type of software makes you “SOX compliant” (false) or that any accounting software packages have been certfied SOX compliant (false again). One area that many companies find problematic is if internal systems are fragmented and incompatible. For example, a manufacturer that uses one application for manufacturing operations and another for accounting may find itself exposed to potential control issues. This is because significant manual re-entry is usually needed to pass data (such as inventory valuation) from the operational system to the accounting system. Any lapse in this area will expose an organization to the risk of material inaccuracies. Sage MAS products offer seamless integration between the inventory system, the manufacturing operations, and the accounting system. 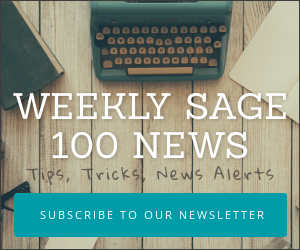 As long as Sage MAS security features have been implemented appropriately, there is very limited scope for information to be lost between modules of the system. Manufacturers are not the only types of organization to be at risk from disparate systems of course. Project-based organizations that use Excel for tracking project performance will be at risk of accounting incorrectly for partially completed projects. Distributors must ensure their inventory levels are recorded accurately so that the accounts can reflect the correct stock valuations. In every case, an integrated system reduces the likelihood of accounting misrepresentation.